Scene 2: Setting: a warm sunny day. (Admittedly, there have been few of those recently.) A gentle breeze is blowing. All is at peace...except for three crazed canines who have decided that running through the garden and playing dodge the dog among my hydrangeas is The. Most. Fun. Ever. Scene 3: Setting: a lovely naturalized patio in a shade garden. A stone seating wall curves around the mossy slate. Birds flit among the bird feeders. Chipmunks scurry and skitter, cheeks swelled up with maple seeds and bird food. Squirrels hop from branch to branch. 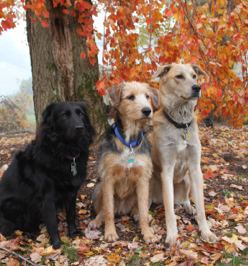 And a trio of dogs Must. Get. The. Chipmunk. Something about that high-pitched squeaky “Tscheep! Tscheep!” of those little rodents and my dogs’ brains universally short circuit. Running, leaping, digging and barking ensue. There were plants in the way? What plants? Exactly. Last year, Xiomara, a good friend of mine, who is also an amazing garden designer (see XiomarasGardens.com), created the most beautiful patio and shade garden--something I’ve dreamed about since Brian and I first bought our house. On the last day of planting, around the huge tree that became a focal point of the garden, she added some gorgeous deep green and white Patriot hostas, and added a flat and a half of bright pink impatiens. It was perfect. My beautiful shade garden and patio, with hostas and pink impatiens...before being trampled by dogs. Jasper and Lilah ran through the mulch, tearing up pink and green and white shreds of petals and leaves. By the end of the summer, you could barely tell there were once pretty, delicate plants around the tree. And this year, we added Tucker to the mix; he just loves to lead the other two in a merry game of Look What I Dug Up That You Can’t Have. But You Can Chase Me to See if You Can Get It. It’s easy enough to see the conundrum. I have wanted a perennial garden for years. I used to fight with the deer (more plentiful in my neighborhood than squirrels) until we installed deer fencing in our back yard. Now I can plant nearly anything I want. But, will it survive the potential damage that 12 marauding paws can do? 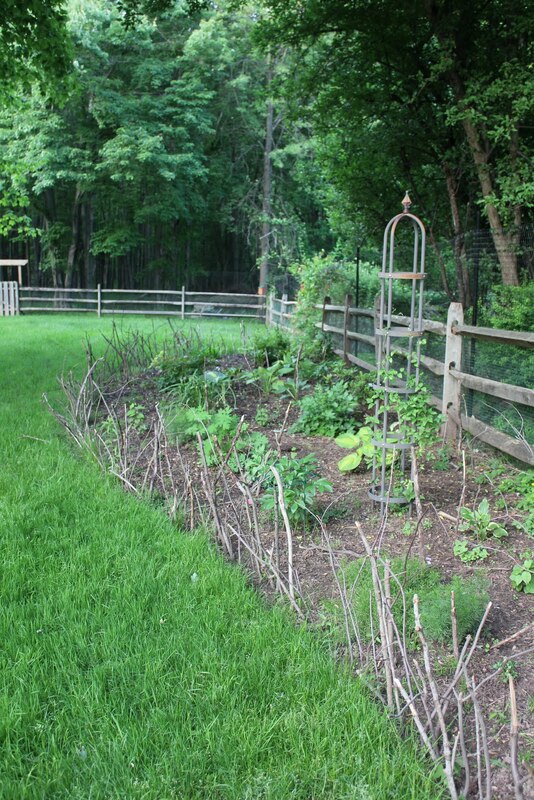 At first I thought I’d build what I called a “visual fence.” Since we have an acre and a half of woods, and the trees are kind enough to drop dead branches of all sizes, on the ground, I went around and collected sticks, which I then stuck in the ground outlining my garden beds. I figured the dogs would see the sticks and think: barrier. 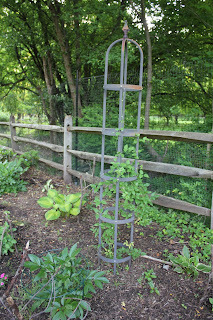 It gave my garden a rustic artsy look, and I was quite pleased. Of course, I didn’t consider the fact that I took Jasper and Lilah to agility training last year, and had taught them that an obstacle was for jumping. They sailed over my sticks. Tucker, who had not benefitted from such training, flew over my so-called visual fence as well. How nice of me to make the chase scene more interesting. 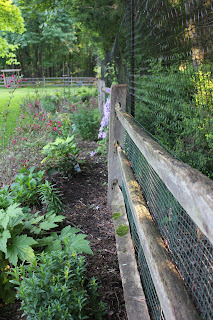 My visual fence bordering the perennial garden. Score: Dogs 1, Susan 0. Aha, I thought: taller sticks. If they’re tall enough, the dogs won’t want to jump them. To his credit, Jasper got the idea. The tall sticks are enough to stop him. But Tucker and Lilah? What was that old camp song? Can’t go around it, can’t go over it, gotta go through it. Doesn’t matter how close together I put my sticks in my rustic fence. They somehow manage to squeeze between the sticks, even running at chase speeds approaching Warp Factor 1. As for the plants around my big tree in the shade garden? I gave it over to the dogs. And made an attempt to create some color there by digging up my hostas and replanting them around the bird bath, which last year was the only area where the plants didn’t get trampled. I bought heavy ceramic pots and shepherds hooks and hanging baskets full of fuschias and thought I was ever so creative. (Until the hooks wouldn’t hold the baskets and I had to turn the pots over and use them as plant stands for this season.) The impatiens (why do I keep trying?) I planted directly against the base of the tree, where the dogs only go if there is an Immediate Squirrel Alert. On average, the plants get knocked off their stands only once or twice a week. For the most part, the dogs can race around and lay in the shade and very little damage is done. A similar view of the patio as above, shown this year, and with dogs. Jasper walks the path by my dog friendlier shade garden. Score: (We both win this round.) Dogs 3, Susan 1. And in my perennial garden, I gave ground (so to speak) to the dogs--in some areas. I acknowledge that they will get in, and will break the rules to go tearing along the fence, particularly if there's Evil Deer on the other side. 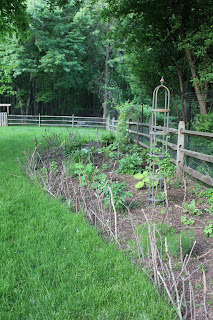 So, for the most part, I've moved my perennials away from the fence, creating a kind of path along the back, so when Evil Deer do show up, the dogs can run along, barking and carrying on, protecting our yard from these nefarious creatures--and trampling almost nothing. I also put a few obstacles in the way, making it hard to run a straight line anywhere in the garden other than along the fence. These obstacles include tomato ladders (I grow tomatoes mixed in with my perennials) and a garden obelisk frame for my clematis to climb on. When the clematis bloom, this Running Obstacle will look even prettier. Score: (I call this one a draw, too.) Dogs 4, Susan 2. The canines are ahead in this game so far. But it’s far from over. I have a few more tricks up my sleeve. 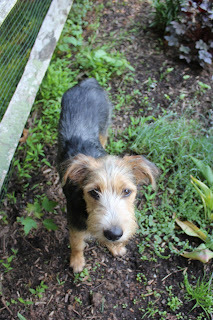 I am pretty sure all the dogs can tell where the grass ends and the garden beds begin. I’ve begun rewarding them for not going in the garden. I walk along the edges, and as long as they stay on the grass, they get treats. When I step inside the borders to weed or poke among my plants, and if they don’t follow, doggy snacks are freely distributed. But I really do want to create a much more visual barrier. In the beds in front of my deck, I’m thinking of putting a very low (2 to 3 inches high) stone border, using stacked slate like my shade garden sitting wall. Perhaps they’ll learn. Or maybe I need to file this whole concept under basic ideas that don’t mix, like oil and water, python and mongoose, matter and antimatter. 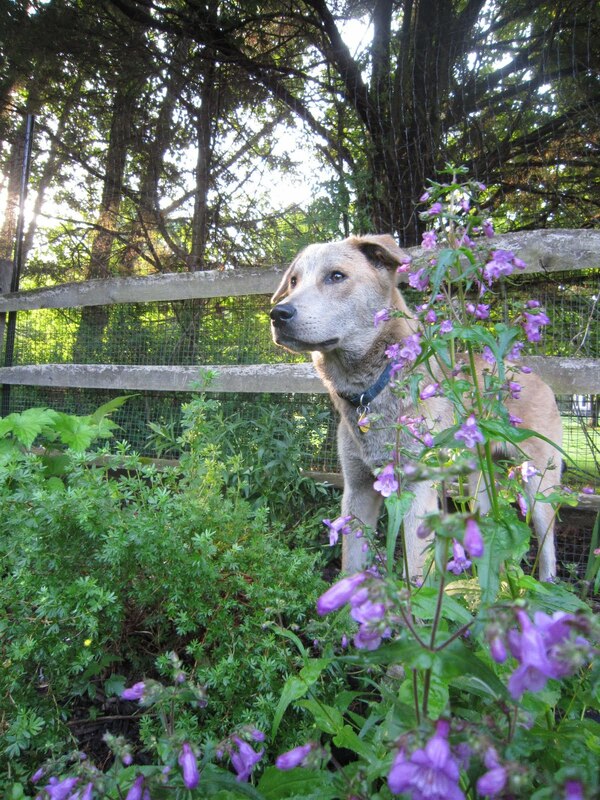 In the end, as I told my husband the other day,I love my garden, but I love my dogs more. So if they lob off a lobelia, crush a chrysanthemum or destroy a day lily, I’ll survive. My plants are replaceable. And even though the 4-legged creatures are currently leading the game at 4 to 2, I still have lots of innings and many seasons ahead of me. Jasper, looking regal, among the perennials.